Custom Imprinted Sun Ray Sunglasses are great choice as promotional gifts for any event happening in the outdoor under scorching sun. They have a total dimension of 2" H X 5.625" D and are presented in exciting color options. These classic folding style eye wears are made of plastic and are coming with UV 400 protective lenses. Along with delivering an efficient shield of protection from the sun, these custom Oahu sunglasses are showing off your brand logo through their 0.38" H x 1.50" W imprint area. Order these printable new arrival sunglasses right now to earn free online proofs, free design and best price guarantee offers. 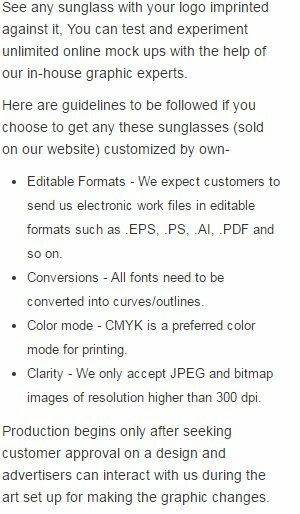 Request a quote to know what you can save on ordering Custom Imprinted Sun Ray Sunglasses.